First stadium near downtown Calama was built in 1952 on the initiative of Abaroa family. It was supposed to serve general sport in the city, but proved not entirely functional especially because of its south stand that impeded the creation of a full running track. It also offered arguable sightlines. 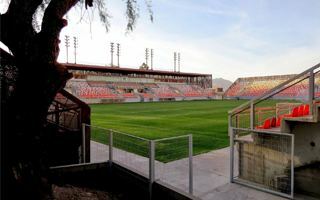 Over the years local authorities took several attempts to rebuild the stadium, but it wasn’t until Calama got included in the nationwide Chilestadios programme that the city finally saw changes. In early 2013 demolition of the old stadium began, forcing local club Corbeloa to move to Antofagasta. And though bulk of construction work was done in just over a year, reopening of a brand new stadium happened in April 2015. Structurally the stadium is a very simple and modest one, but decorated with interesting features. Outer cladding and roof are made with copper netting. Not without good reason as the city lies in Chile’s copper mining hub. The colours and official stadium name (voted by popular demand to includes Zorros del Desierto or “Desert Foxes”) also link to the red foxes which have their habitat here. All four corner sections are empty, but for different reasons. North-west and south-east are restricted by local roads. In turn the two remaining corners are used as semi-covered public plazas providing better access to the stands. Regardless of its aesthetic value or lack thereof, the stadium has for years been known as… well… hell. Literally El Infierno is a well deserved nickname for a stadium located at altitude of 2260m (7,400 feet), in a desert area with heat sometimes hardly bearable for visiting teams.